Strong degreaser is a universal product based on an organic solvent, which is used for easy removal of grease, oil and other greasy soils. 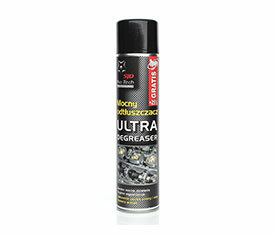 The product is used for degreasing brake discs, clutches, brake drums, fuel pumps, gear and cleaning the metal parts of the engine. It contains acetone. Shake before use. Spray it on cleaning element and wait a while. Cleaning elements dry outside or clean it with dry cloth. Product contains acetone so do not test it on not metalic elements.